Develop a routine to get you ready for your best performance. 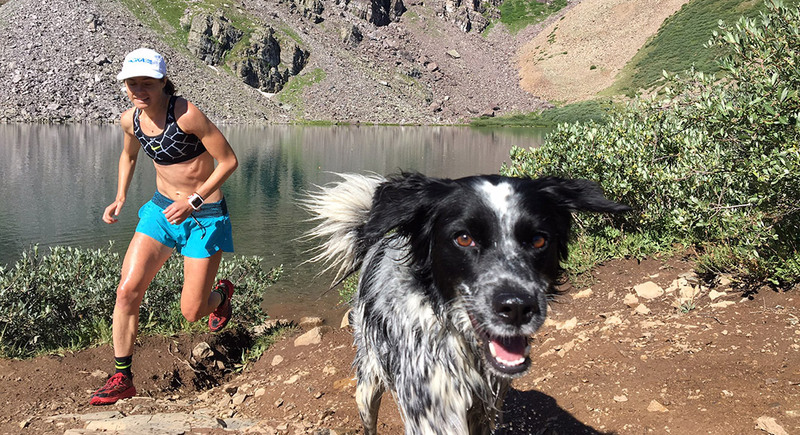 Even puppies can use a good warm up, like this one for Addie dog up to Cathedral Lake outside Aspen, Colorado. Photo by David Roche. We have all had those race mornings. You wake up at 4 a.m., feeling like three pounds of bricks in a one-pound sack. Your legs are heavy, your eyes are sleepy and your bowels are lazy. All too often, excitement for the race can turn to dread and an existential crisis over coffee. Why am I doing this? Why are my bowels not doing this? Sometimes, the psychological battle can be lost before the starting gun even sounds. 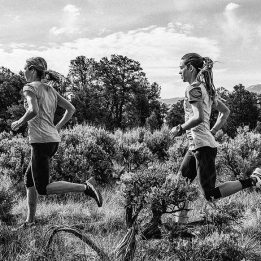 At first, many of the athletes I coach fret unnecessarily about what they should do to get ready to race, or even if they should do anything at all. A good warm-up routine cuts through the self-doubt and can make sure your legs are ready even if they feel like bricks when you wake up. 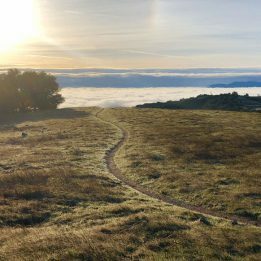 Showing up to the race start and taking your first steps when the gun sounds can be a recipe for disaster for some runners, even at ultra events. Excitement and nerves can skew your perceived exertion, causing you to run too hard at the beginning—and going too hard without preparation can ruin a race before it starts. Even if you start like a sedated turtle, feeling crappy at the start can set a bad tone for the rest of the day. While top coach Steve Magness wrote in 2009 that studies on warm ups “are all over the place,” warming up is an essential component of elite athletes’ pre-race routine because it serves as a neuromuscular, metabolic and psychological primer. Neuromuscular: Warming up effectively acts as a big “on” switch for the brain and body, preparing your muscles to fire efficiently during the race. A review study in the journal BMC Medicine in 2012 found that neuromuscular warm-up strategies (activities that go beyond walking or slow running) decrease lower extremity injury risk. 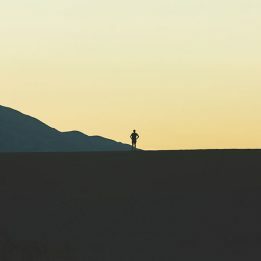 While there is less information on the direct link between warm ups and performance, a study from in the obscure Serbian Journal of Sports Sciences in 2008 found that jogging paired with dynamic exercises increased time to exhaustion (that is: athletes who warmed up took longer before they got tired). Metabolic: Warming up also revs the aerobic engine, getting your cardiovascular system ready for the demands of the race. For example, a 2009 study in the Journal of Science and Medicine in Sport found that a warm up reduced athletes’ relative anaerobic lactic energy contribution—essentially, that warming up decreased the amount of time that athletes spent in an anaerobic state, as opposed to a more sustainable aerobic state. The takeaway is that warming up could make athletes more aerobically efficient (note: that study found no increase in time to exhaustion). In addition, a 2007 review study in the journal Sports Medicine described that simply warming up the temperature of muscles before a run can improve performance. Psychological: While the psychological benefit of a warm up is difficult to isolate in a study, it’s something many experienced runners describe. That pre-race routine acts as a security blanket that you can turn to for a sense of calm, no matter where you are racing, or how far. Plus, anecdotally, a warm up seems to help get the juices flowing in more ways than one, facilitating productive trips to the Porta Potty before the race starts. Research and long-standing athlete practice has coalesced around a warm up that involves easy jogging (primarily for metabolic and psychological priming) coupled with dynamic movements (neuromuscular and psychological priming). While there are many protocols and practices that can work, here is a four-part warm-up strategy that I recommend to my athletes (as always, find what works for you, which may vary substantially). T minus 1 or more hours before race starts: Get outside and walk. Cooped up inside a house or hotel room, running a race can seem psychologically daunting. A quick five to 10 minute walk well before the race can open the brain up to the possibilities of the day. Plus, a little gravity can help the pre-race coffee percolate through your bloodstream (and intestines). Add some sports drink for hydration if possible. T minus 30 to 45 minutes before race starts: Do some light dynamic exercises. Prior to doing a jog, get your blood flowing with a short dynamic warm up consisting of some lunges and leg swings. Warning: don’t do lunges pre race unless you do them nearly every day in training, as they can increase muscle fatigue. A quick set of leg swings (10 front-to-back, 10 side-to-side) is a good way to get some neuromuscular priming. Add a few skips, high knees and push-ups for bonus points. T minus 20 to 30 minutes before race starts: Jog easily for five to 10 minutes. For trail races over 10K, there is no need to do a strenuous warm up like track runners. Metabolic priming only requires a short jog—think purely aerobic, zone-one heart rate, with light, quick steps for some extra neuromuscular priming. When I first started running, I worried that this type of jogging would increase fatigue prior to the race start, but if you keep it easy enough, it could actually increase time to exhaustion in some athletes by improving aerobic efficiency. I recommend athletes do the warm-up jog in long pants to increase the warming effect. A final few sips of sports drink after the jog can top off hydration before the race starts. T minus 10 to 20 minutes before race starts: Do two to four strides just a tick faster than you will go in the race, along with some leg swings. The neuromuscular cherry on top is a set of strides around 50 to 100 meters where you go a bit faster than you will go in the race (which could be rather slow for an ultra). This ensures your brain and body are ready for the specific demands of the event. For a psychological boost, strip off those long pants prior to doing the relaxed strides. You get bonus points if you rip them off like in the movie Full Monty. Add some relaxed leg swings to get a final neuromuscular boost. T minus 0 to 10 minutes before race starts: Bounce around and do short, light strides as needed. With the warm-up in the rear-view mirror, you should be feeling locked and loaded, both mentally and physically. With the rest of your time before the race starts, do light physical activity to stay warm and practice mindfulness about the race to come, focusing on being in the moment and finding contentedness. You get additional bonus points if you combine mindfulness with a quick bathroom trip. Once you find the warm-up routine that works for you (which can vary from the template above), you will have your pre-race security blanket. Just be sure to combine some easy jogging with dynamic activities like strides or leg swings. With that, your brain, body and bowels will be ready to face the challenges ahead, whatever they may be. Love the article. I’m still new to ultra running (training for my second 50k now) but am astounded that if I tell myself “you’ve got a long run tomorrow” then within 15 minutes I’m heading to the bathroom. Can’t explain it other than it works. I also like comfort warmup food. 5 tortilla chips is my go to.